Storyline's scrolling panel feature is a great tool when you want to display large images, large amounts of text, or other objects that don’t fit well within the space you want to place them. 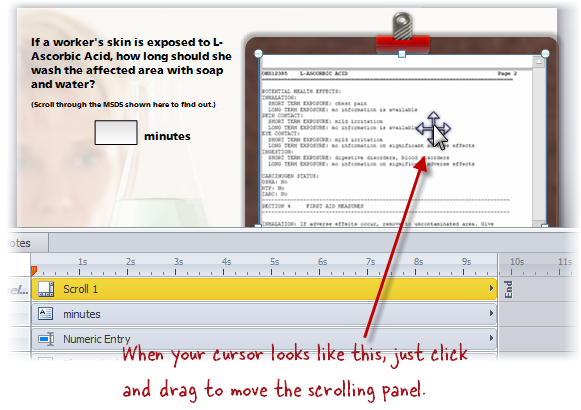 A scrolling panel allows learners to scroll vertically so that they can see whatever content you've placed inside it. Scrolling panels can contain just about any objects: pictures, screenshots, videos, shapes, captions, markers, characters, web objects, text boxes, buttons, hotspots, data entry fields, and mouse cursor objects. Pretty much the only thing they can't contain is additional scrolling panels, or objects that originate from the placeholders on your slide master layouts. Tip: In mobile Safari, use two fingers to scroll through scrolling panel content. Go to the slide or slide master where you want to insert a scrolling panel. Select the Insert tab, and click Scrolling Panel. Your cursor changes to a crosshair. 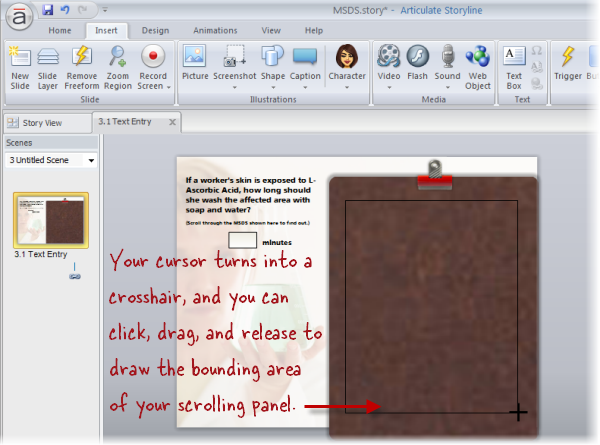 Click and drag on your slide to draw the scrolling panel. Tip: Some users find it helpful to draw the scrolling panel especially large at first (since that makes it easier to insert objects into it) and then drag the handles on the scrolling panel to make it smaller. Keep in mind that no scroll bars will appear unless the scrolling panel is smaller than its contents. Once you've drawn your scrolling panel, it'll appear with a thin, dotted bounding box. Now you can drag items into the scrolling panel, and resize, move, or format the panel as you like. First, insert the object onto your slide. Select the inserted object and drag it over the scrolling panel, making sure your cursor is also over the scrolling panel area. If your object is taller or wider than the scrolling panel, you'll notice that its sides become concealed by the boundary of the scrolling panel once it's inside. Release your mouse button to drop the object into the scrolling panel. Select the scrolling panel on your slide. To move the scrolling panel, hover over it after selecting it, and when your cursor changes to a four-pointed arrow, click and drag the scrolling panel to the place you want it to be. Any objects you've added to the scrolling panel will move right along with it. Select an object within the scrolling panel. Once you've select an object, just drag it away from the scrolling panel and drop it on any other part of your slide. Now you can click on any of the ready-made Shape Styles, or choose your own fill color and outline color by using the options on the ribbon. For even more flexibility, you can click the small arrow in the lower-right corner of the Shape Styles section of the ribbon to access the Format Shape window. 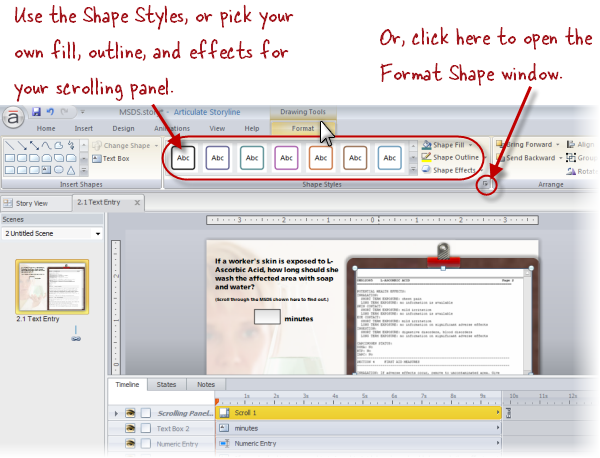 For guidance on how to use the formatting tools, check out the tutorial for Adjusting Properties for Shapes, Captions, and Text Boxes, and the tutorial on using the Using the Format Shape Window, since the formatting options for scrolling panels work much the same way.